Performances are held at McInnis Auditorium, Eastern University, St. Davids Campus, a scenic 106-acre suburban campus in St. Davids, PA. Free Parking is available in lots adjacent to McInnis Auditorium. Enter the campus via the main entrance on Eagle Road. Take Exit 13 (St. Davids/Villanova). Follow signs for St. Davids, Rt. 30 West(Lancaster Ave.) At light for Radnor--Chester Road (Radnor Hotel on corner), turn right. At the end of the road, turn left onto King of Prussia Road. At the second light, turn left onto Eagle Road. Turn left into main entrance of Eastern University and stay on Thomas Drive. 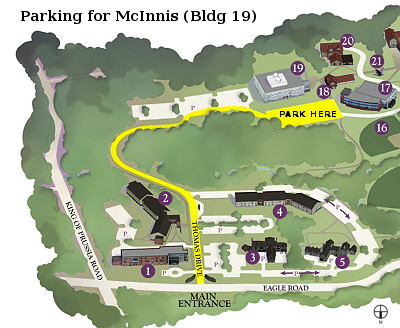 You'll approach McInnis Hall from the rear parking lot, where there is handicapped access. Bear right for the main parking lot on the side of the building and use the path to the front entrance. West on I-76 to exit for I-476 South (Blue Route.) Follow directions above. Take Lancaster Avenue (Route 30) west. Proceed past I-476 (Blue Rt.) 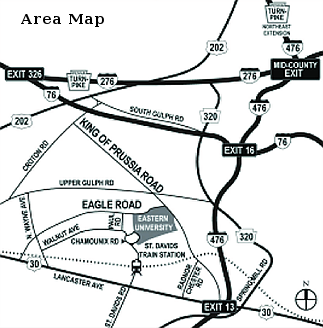 Turn right onto King of Prussia Road then make left at third traffic light (Eagle Road.). Turn left into main entrance of Eastern University. Continue to main parking area. Take Lancaster Avenue (Route 30) east. Proceed on Lancaster Avenue to King of Prussia Road. Turn left and continue to third traffic light (Eagle Road.) Follow directions from I-476 South (The Blue Route). Free Parking is available in any of the lots at Rosemont College. Rotwitt Theater is inside the Dorothy McKenna Brown Science Building (aka McShain/Brown Center). Enter the campus via Curwen Road off Montgomery Avenue and park behind the Science Building. The rear building entrance is convenient from the Science Parking lot and for handicapped access. You can also park in Mayfield Parking or Alumnae Hall Parking and use the front entrance to the building.